Thanks SO much to ralfstc, who sent me this pen, which I LOVE: from researching online, I believe it's a Waterman's 352 Stalwart, made in Canada in the 1940's. According to ralfstc, the nib was modified by John Sorowka (Oxonian). 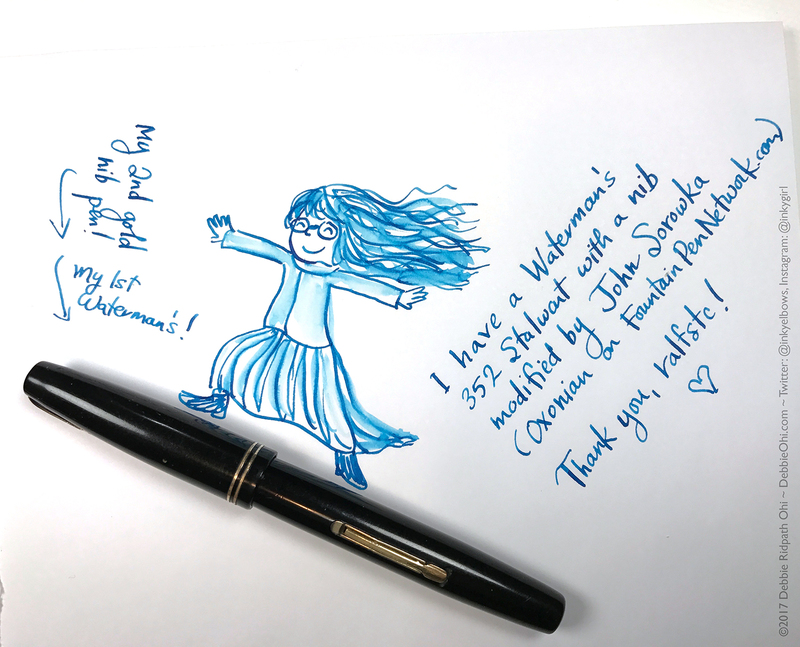 I love fountain pen people! And again, THANK YOU, RALFSTC! So looking forward to writing with my new pen. I've inked it up with Iroshizuku Kon Peki. Nice! What nib size was it? Do you think it is suitable for drawing? I love how it was set up to make the drawing seem like it was riding the pen like a surfboard. FlippyThePen: I'm not sure what size nib it is. I looked at it but couldn't see an "F" or "M" etc. Mike.jane: Thank you! And no, I didn't set the lighting on purpose. I suppose I should have!